Jay and I were up, showered and ready to go by 4:45–sleep was on hold for another time. Phurwa was already waiting at the front desk. The streets of Kathmandu were deserted at that time of morning as the van made its way to pick up the four others joining us. Their destination is Everest Base Camp, but first they will trek with us to Taksindu and Chhulemu. Jesse is a videographer from Silverthorne and will be taking footage of our project in Chhulemu and then he and his cameras will follow on to Base Camp. 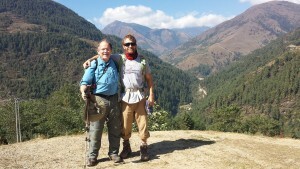 He will be making a documentary for HDF and a separate one for Sherpa Mountain Adventures. John and Celia are veterinarians from Colorado Springs and Ilse is a psychologist friend of theirs from South Africa. The section of the airport for in-country flights is cacophony of sounds and presents itself as an impossible chaos of travelers, employees, security, and baggage. Navigating our way through this is the first test of our Sherpa guide. He succeeded. The plane ride lasted only 30 minutes, but provided the first breathtaking scenery of craggy snowcapped peaks that make up the world’s tallest mountain range. 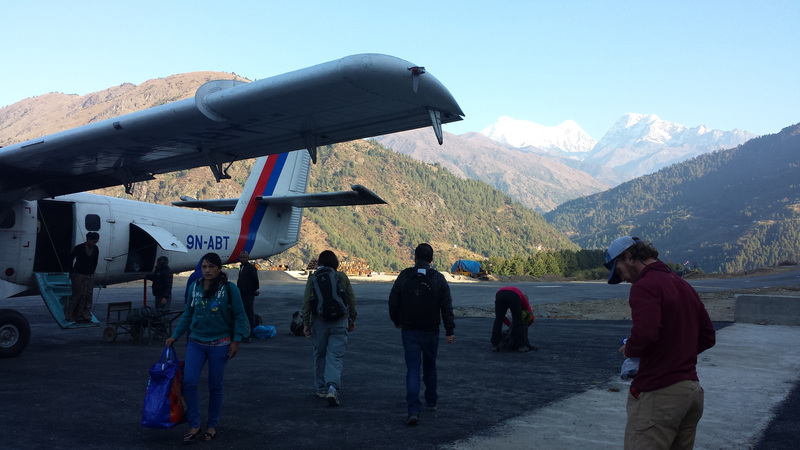 We arrived in Phaplu and gathered for tea at a lodge across the street from the airport, which served as our staging area before the trek began. Sherpa is a name of a tribe of people who migrated from Tibet more than four hundred years ago, settling in what’s now known as the Solukhumbu area of Nepal, that land south of and including Mt Everest. As a tribe, they all take on the last name of Sherpa. My friend from Boulder, Karma Sherpa, and his brothers living in Nepal, Phurwa, and Ngima own a trekking company, Sherpa Mountain Adventures. This is the third trek I’ve been on which they’ve organized and led. 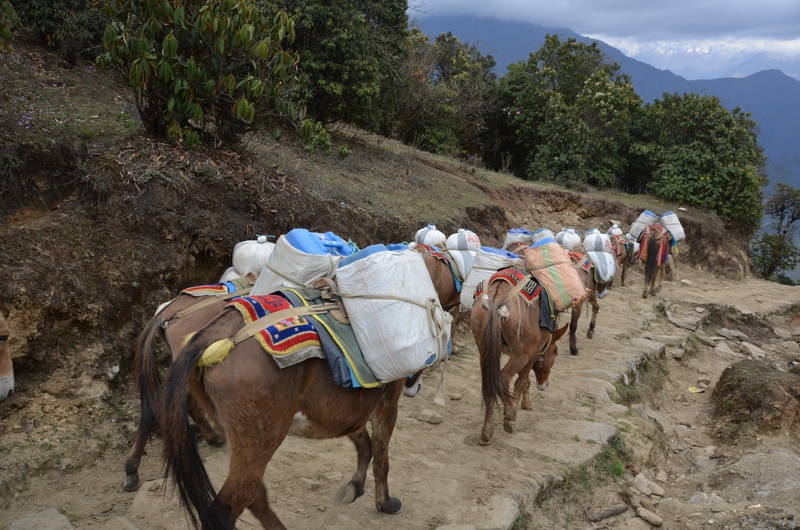 In my previous treks male porters have been employed to carry our gear and provisions. This time a breed of animal known as jopke, a cross between a type of domestic cow and a yak are being employed. Phurwa told me they are using these animals because not enough porters could be found. We took a tour of the town and came back to a picnic style early lunch made and served by our crew in the backyard of the lodge. 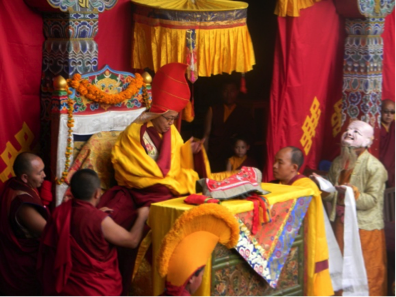 The Sherpa are Buddhists and as we are in “Sherpa Land”, we are also in a Buddhist culture. All of our meals will be vegetarian, with the exception of occasional servings of canned tuna or processed meat. 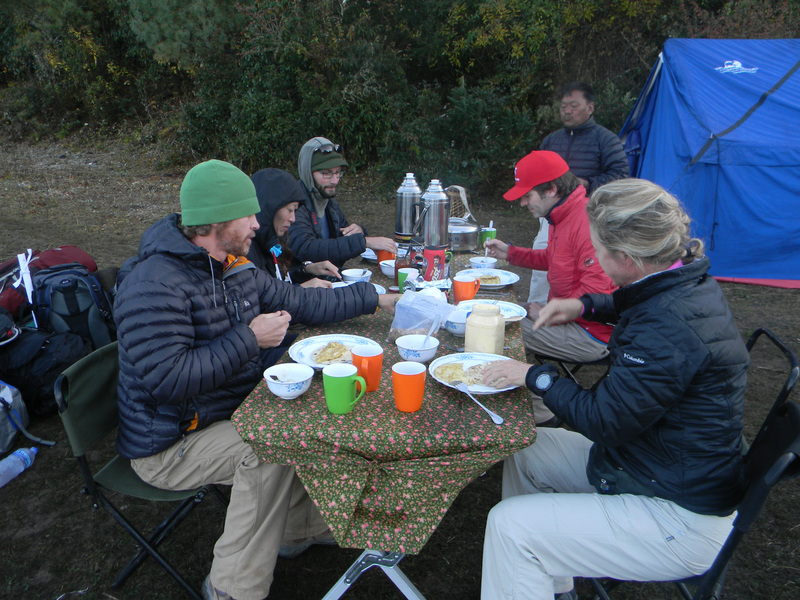 This outstanding meal included a hearty soup, fresh cut vegetables, a Sherpa stew with rice, flatbread, and a side of tuna. 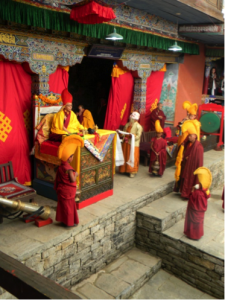 The main trekking trail to Mt Everest begins at Phaplu, winding its way up and north to the great mountain. Measurements of distance are made in days walking, not miles or kilometers. 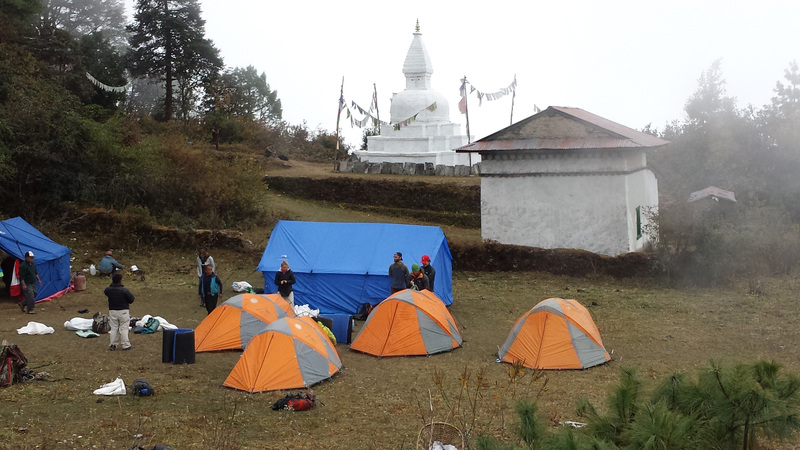 It’s a seven day walk without rest from Phaplu to Base Camp. 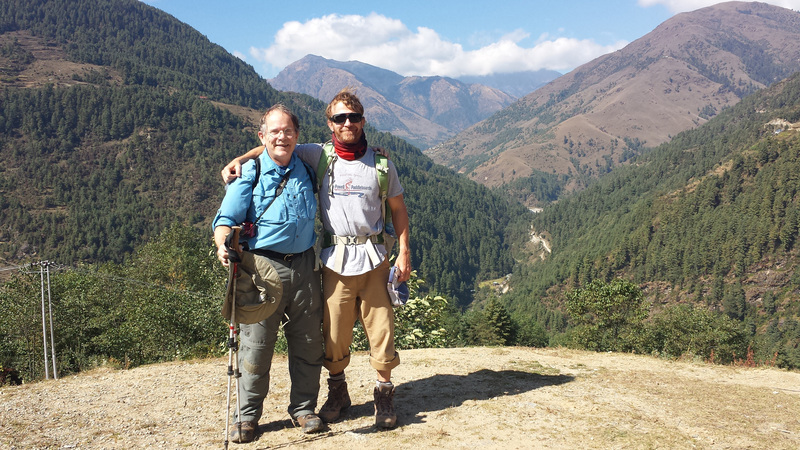 We walked on the main trail some distance out of Phaplu, then took a detour up a smaller trail for a couple hours, arriving at a mountain top monastery where a festival was going on. That night we made camp and slept in tents in a clearing just below the monastery. The local Sherpas made an all-night party out of the celebration, with lots of drinking, dancing, and music. Nevertheless, I got caught up with the sleep I’d missed the night before. There is no exercise better for the heart than reaching down and lifting people up.~John Andrew Holmes, Jr.